Shock Robert Sangster Stakes scratching Viddora has recovered from a minor setback and is back in contention for the 2018 Group 1 $1m Darley Goodwood (1200m) at Morphettville on Saturday. Viddora, above, is back in contention for the 2018 Goodwood at Morphettville. Photo by Jenny Barnes. A mystery injury to her hind tendon that became apparent on race morning forced trained Lloyd Kennewell to scratch Viddora from the Group 1 $1m Robert Sangster Stakes (1200m) at Morphettville on May 5. 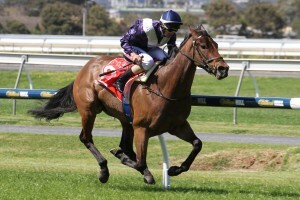 Viddora was prominent in the betting for the Robert Sangster Stakes that was eventually won by the Anthony Freedman trained Shoals. “I think we’re back on track,’’ Kennewell told The Advertiser. “She’s had a really good week on the training track,’’ he said. “She hasn’t really missed a lot of work and is best a month between runs. “She’ll have her final piece of work on Tuesday morning, it will be a solid gallop. Viddora claimed her first Group 1 trophy with a win in the Group 1 $1m Crown Perth-Winterbottom Stakes (1200m) at Ascot during the 2017 Perth Summer Carnival and then went to the Gold Coast in Queensland to win the $1m Magic Millions Snippets (1200m) at in January. The I Am Invincible mare then resumed from a break for a first up second to Dainty Tess in the Group 3 $120,000 Hughes Limousines R N Irwin Stakes (1100m) at Morphettville on April 21. The final field for the 2018 Goodwood will be released Tuesday, May 15. Betting for the Goodwood at Ladbrokes.com.au has Vega Magic as the dominant $2.40 favourite ahead of the Anthony Freedman trained Santa Ana Lane and Viddora who share the second line of betting at $11 while Secret Agenda is marked at $13 alongside of Darren Weir’s Voodoo Lad.